"Steve Austin, astronaut. A man barely alive." "We can rebuild him. We have the technology. We can make him better than he was. Better. . .stronger. . .faster." There might be some disagreement out there, but in MY extremely humble opinion, Steve Austin, The Six Million Dollar Man (also known to us kids at the time just as The Bionic Man) is the ultimate 70's superhero. There are some that might claim that he isn't a superhero at all, and belongs in the realm of science fiction. . . but as far as I'm concerned, the work of the finest scientific minds fused with the soul of a man isn't just A great 70's superhero, but is THE superhero that defines the 70's. Science today is taken for granted. I'm probably making myself sound old, but in the 70's, Astronauts were still the great American Hero. The moon landings were still fresh in the collective memory. The world was on the edge of major change in technology. You could SEE the future coming. The Six Million Dollar Man was a reflection of these things. He was technology ahead of his time in a world that was advancing toward major breakthroughs, but not quite there just yet. This was a character that seemed possible and real in a way that someone like Superman could never be. I don't think I speak for ALL the children of the 70's, but I'm pretty sure I speak for a lot of them when I say that the Bionic Man was OUR hero for OUR time. Steve Austin always used his powers for the greater good, even if it meant going against the direct orders of his O.S.I. "controllers", and THAT makes him a hero, whether he wears a cape and mask or not. My love of this character is based almost entirely on the extremely popular (at the time) T.V. show and accompanying movies starring Lee Majors. 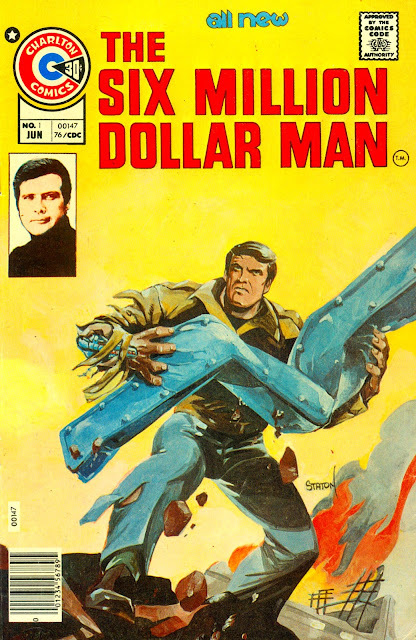 At the time, I didn't even know that there WERE Six Million Dollar Man comic books. The spinners at my local stores when I was a kid only had DC and Marvel comics. . .maybe a few Disney comics for the little kids. It wasn't until the early 90's when I started seriously collecting comics instead of just reading them that I discovered the existence of companies like Charlton. I managed to FINALLY find a few of the Charlton Six Million Dollar Man comics (This one plus Issues #2 and #6) in the back issue bins of a comic shop in Idaho while visiting one of my nieces a few months ago. So how do the comic books stand up against my nostalgic memories of the T.V. show featuring one of my favorite superheroes of all? There's two comic stories and a short text story in this book. Let's take a look at them each. . . Colonel Steve Austin is a veteran Astronaut and test pilot who barely survives a bad landing in an experimental aircraft. Oscar Goldman (An agent of O.S.I., the Office of Scientific Intelligence. . .or Office of Strategic Information, depending on the source ) informs Austin's doctors that the government has taken an interest in him, and is willing to pay to "improve" the injured man with millions of dollars worth of cybernetic implants. After the successful operation, Goldman tells Austin that the price for his life is that he now works for the O.S.I., and after some intensive training missions, Colonel Steve Austin. . .the Six Million Dollar Man. . .is ready for his first assignment. 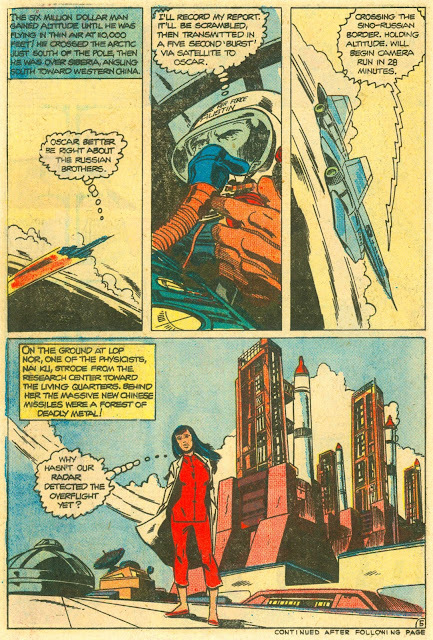 The first story in this comic is basically the origin story of the Six Million Dollar Man, expanded out from the narration at the beginning of the T.V. show to give a bit more detail to Austin's deadly accident and the process that led to him becoming the Six Million Dollar Man. As a big fan of the character, I REALLY liked this story a lot, and it made me like the character even more! 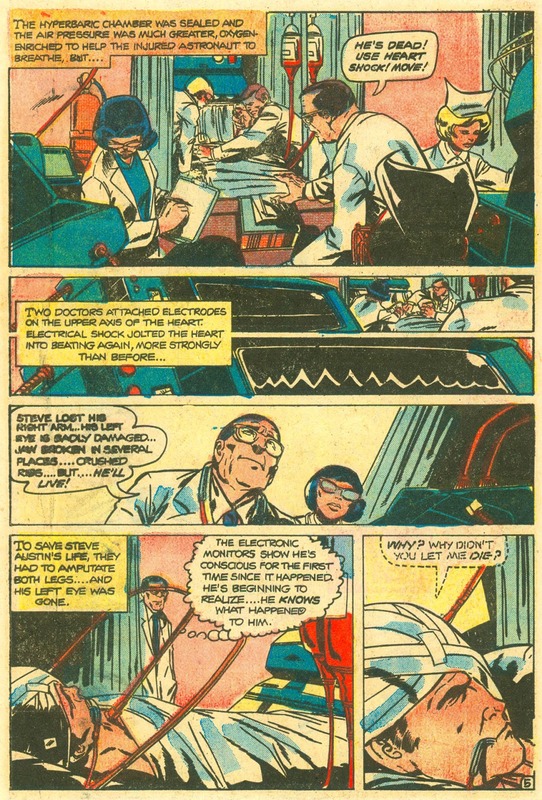 One thing that especially stood out is the last panel pictured below (the page very nicely shows the struggle to keep Austin alive) where the critically-injured test pilot regains consciousness for the first time and realizes the shape he's in. The first words from his mouth are "Why? Why didn't you let me die?" That's a really dark place that the show never went to, and that one single panel gives the character a layer of depth and reality that I'd never considered before. Also unlike the show, one of the training montage panels shows that Austin's bionic parts can be swapped out for different missions. . .in this case, retractable swim fins for an underwater training mission. The T.V. show probably didn't have the budget (or special effects technology) to show this aspect of the character, but now that I've seen it, it makes perfect sense. The line art and inking on this first story are both very nicely done. . .unfortunately, the art is marred by extremely sloppy and occasionally garish coloring. It's a damn shame, to tell the truth, because there are several scenes that SHOULD be epic and dramatic that are practically ruined by the bad colors obscuring the great art underneath. Overall, if this one story were all that there was to this comic, I would be more than happy. It's a great expanded origin story for the Six Million Dollar Man that goes beyond the sketch we got at the beginning of the T.V. show. It's pretty short, and the otherwise great art is botched with bad coloring, but to me, this story is worth the price of the comic alone. Colonel Steve Austin is assigned to fly an SR-71 spy plane over China to gather intelligence on a new long-range missile system. A malfunction causes the jet to crash near the missile base, and Austin is captured. The sadistic director of the base decides to use both Col. Austin and a Chinese scientist (a woman named Nai Ku) that has been working with O.S.I. to field test a deadly combat robot also being developed at the secret weapons base. After a tense battle, Nai Ku manages to reprogram the robot to attack the Chinese soldiers guarding the laboratory, making it possible for her and Austin to escape. After commandeering a helicopter, Austin uses his laser eye to destroy the experimental missiles before making their way to a nearby airfield to steal a jet and fly back to friendly territory. Back at O.S.I. headquarters, it's revealed that the intelligence gathering was a ruse, the jet was purposely sabotaged to crash near the secret base, and that the REAL mission was to extract Nai Ku. Steve takes Oscar Goldman's dangerous subterfuge in stride, chalking it up to just another day at O.S.I. After the great opening story, I felt a little let down by this one. Not that it's BAD, it's just that it had to follow a pretty good act. While the story itself seemed a bit contrived and weak, there were parts of it that I really liked a lot. First off, we got to see Steve Austin in the kind of adventure that a T.V. budget and 70's special effects could never have pulled off. . .him piloting an SR-71 Blackbird over China. 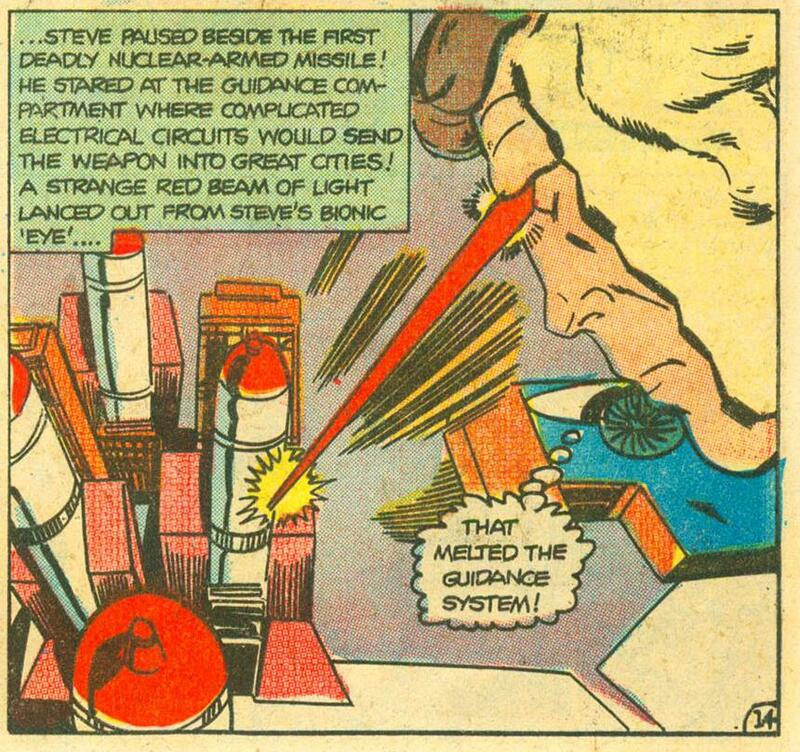 . .
. . .and then destroying a missile with his LASER EYE! Like I said about the first story, this story shows new powers for The Six Million Dollar Man that make perfect sense once you see them. Laser Eye. . .how could they NOT have had that on the T.V. show? I feel a bit cheated now, that all those times I played Bionic Man with my friends, I COULD have been zapping them with my awesome laser eye! On the bad side of things is that about half of this story is basically a "punch the giant robot" comic cliche battle that's STILL being used as story filler to this very day (Black Widow #1, 2019. I'm looking right at YOU). The line art and inking remain pretty strong in this story, perhaps just a BIT weaker than in the opening story, and still badly marred by sloppy coloring that occasionally obscures the good art underneath. One thing I really DID like about the art in this story is the way that Austin's bionic powers were portrayed. In the show, it went to slow-mo and we got that iconic "NA-NA-NA-NA-NA-NA" sound. Hard to do in a comic book. Instead, the panels break down into smaller panels focusing closer and closer on the bionic action. It's a nice compromise that works very well. . . Overall, this story is a bit weaker than the first, but I still found it pretty entertaining. It showcased the kind of missions and new powers for Steve Austin that the budget and technological limits of 70's T.V. could never have given us. The last story in this comic is a two page text piece. . .
After successfully landing an experimental aircraft from orbit for NASA (obviously an early version of what the 70's were imagining the Space Shuttle would be), all Colonel Steve Austin wants is a 10 day rest. Oscar Goldman and the O.S.I. have other plans and Steve's next mission is planned for the following day. 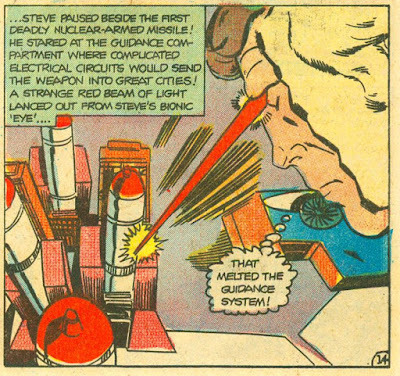 To make sure he stays put, Goldman has Steve put under guard, but the Bionic Man uses his laser eye to make a stealthy escape. Later, he calls Goldman to remind him that he's still a man and not just a tool, and that he'll be back in 10 days. I liked this little story quite a bit. It's well written and perfectly captures the "Man" in the Six Million Dollar Man in a very short space. I'm not normally a fan of text stories taking up space in comic books that could be used for actual comic stories, but this is one of the exceptions. As a fan of the Six Million Dollar Man, I've been wanting to get my hands on some of these comic books for years. I'm happy to say that I wasn't disappointed. This comic had a fantastic opening origin story that gave the character some unexpected depth, a somewhat weaker but still entertaining main story that showcased the kind of missions that 70's T.V. could never give us, and a short text finisher that illustrated that there's still a Man in the Six Million Dollar Man. Despite sloppy coloring, the line and ink art was strong, and despite some comic cliche robot punching, the writing was likewise strong. All in all, this is a pretty great comic book for fans of The Six Million Dollar Man. What about for those who AREN'T already fans of the character? I had my comic lovin' daughter give it a read. She's watched a few episodes of the T.V. show with me here and there, but old T.V. shows aren't really her thing. She also found the coloring to be extremely sloppy, but her general opinion of this comic is that it's pretty good, and better than some of the superhero comics of the 70's she's read. I asked her if she'd want to read another one and she was like, "Sure, why not?" So I'll chalk that up in the win column. My daughter also pointed out to me that to HER eyes, some of the dialogue was pretty cringeworthy in a casual 70's misogynist way. Steve Austin gives the female scientist he rescues in the second story two "Honey's", two "Baby's" and a "Sweetheart" in the space of 15 pages and about 1 hour of knowing her. She found it more "Funny-Cringe" than "Offended-Cringe", but I can agree that the Bionic Man's swagger is definitely 70's-Tastic. So. . .in the end, sloppy coloring marring the otherwise good art, some cliche robot punching, and a bit of 70's dialogue that might fall flat on younger readers doesn't stop this comic from being a good read for both fans of The Six Million Dollar Man or those new to the character. Back to Longbox Junk business as usual with Marvel's 1983 4 issue "Cloak and Dagger" mini. I have a lot of love for The Six Million Dollar Man, and like you, it was a favorite of all the kids in the neighborhood. Thanks for taking me on this trip down memory lane!